Directions(1-2): Read the following information carefully and answer the questions given below it. 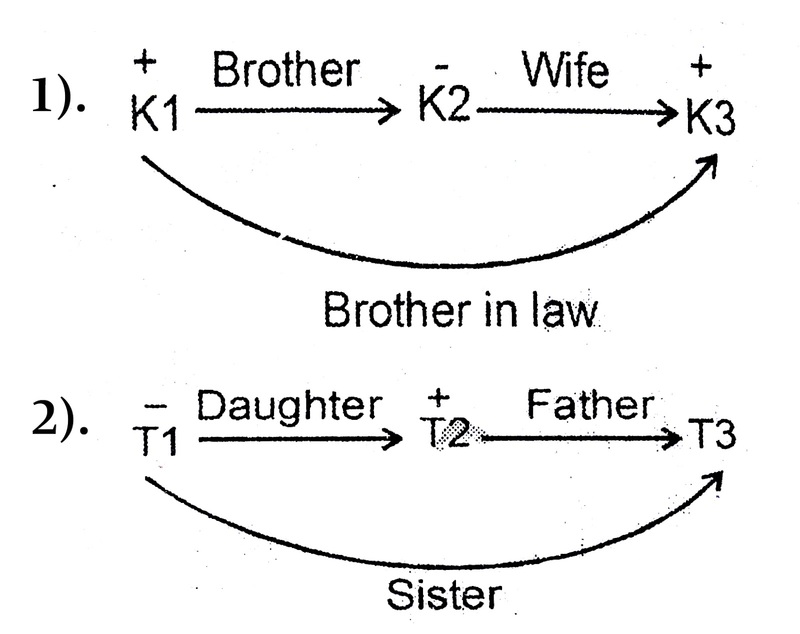 1).If K1×K2-K3, which of the following is true? 2). If T1÷T2+T3, which of the following is true? Directions(3-4): Read the following information carefully and answer the questions given below. A. 1#2 means 1 is the son of 2. B. 1$2 means 1 is the daughter of 2. C. 1@2 means 2 is the father of 1. D. 1÷2 means 2 is the mother of 1. E. 1×2 means 1 is the wife of 2. F. 1&2 means 2 is the husband of 1. 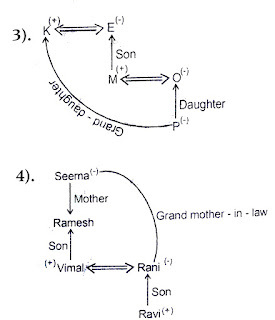 3).Which of the following expressions shows that P is the grand-daughter of K? 4).Which of the following expressions shows that Seema is the grand mother-in-law of Rani? Directions(5-7): Study the following information carefully and answer the questions given below. A. ‘P@Q’ means ‘P is sister of Q’. B. ‘P#Q’ means ‘P is brother of Q’. C. ‘P$Q’ means ‘P is mother of Q’. D. ‘P÷Q’ means ‘P is father of Q’. 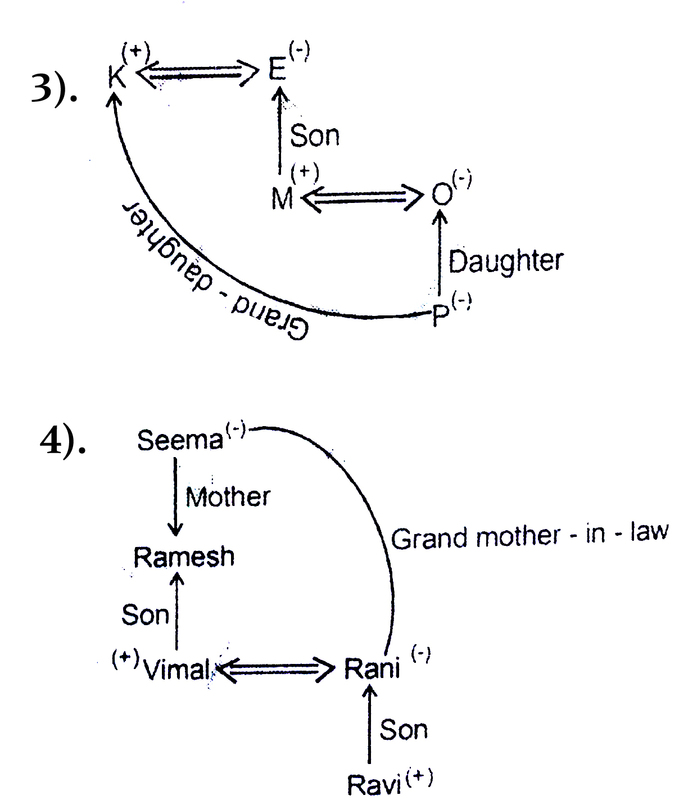 5).Which of the following means ‘N is the grand-daughter of P’? 6).Which of the following means ‘K is the aunt of N’? 7).Which of the following means ‘G is the uncle of S’? Directions(8-9): Read the following information carefully and give the answer of questions given below. 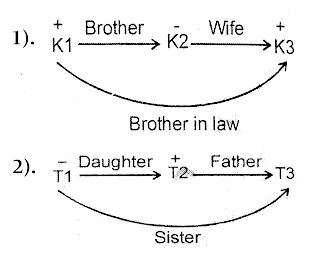 A. P+R means “P is the brother of R’s sister”. B. P÷R means “R is the son of P”. 8).If A+B÷K, which of the following is true? 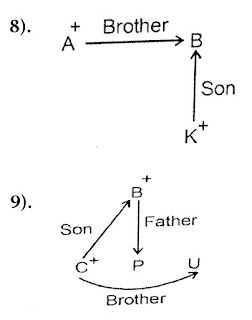 a) A is the brother of B.
b) A is the uncle of K.
c) A is the son of K.
d) A is the father of B. 9).If PΔB÷C+U, which of the following is true? 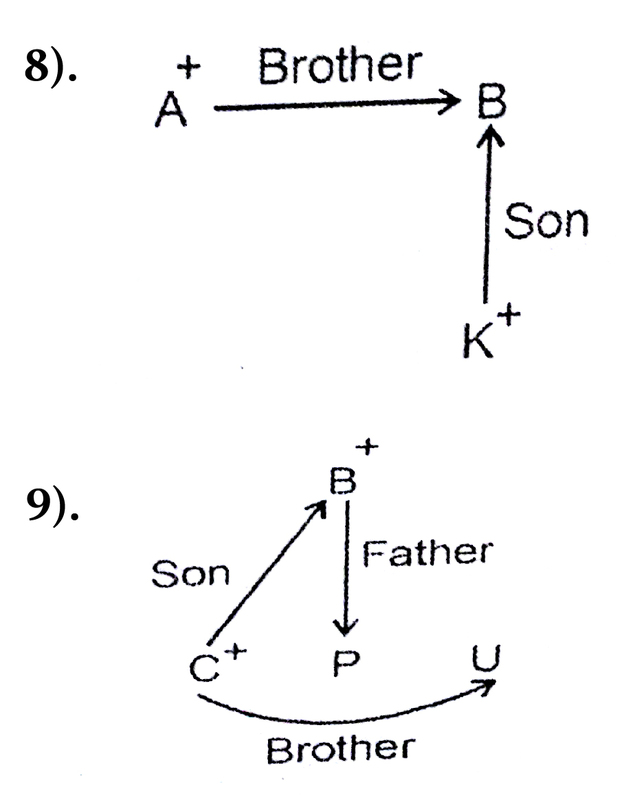 a) P is the cousin of U.
b) P is the father of C.
c) P is the son of U.
d) C is the son of P.
e) U is child of B.